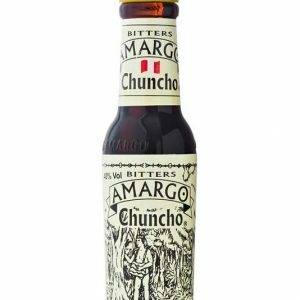 Amargo Chuncho bitters were named after the ethnic group of Amazon Indians that resisted the Spanish Conquistadors. They are the original Peruvian bitters and are the only bitters for a truly authentic Pisco Sour. Chuncho is a complex and well balanced combination of over 30 various peels, herbs, roots, barks and flowers from the Peruvian forest (including Quina and Sarrapia leaves, both of which appear on the Peruvian flag) that are macerated then rested for six months in oak barrels before being bottled.